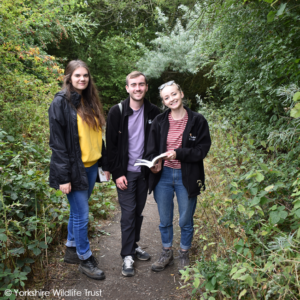 John Cave from Yorkshire Wildlife Trust’s Tomorrow’s Natural Leaders (TNL) project, tells us about this summer’s Youth Summit that they hosted at the Potteric Carr Nature Reserve in Doncaster, South Yorkshire. 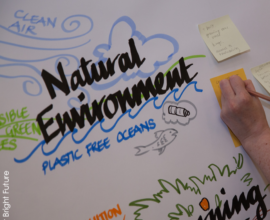 The day had a relaxed atmosphere, with a fantastic range of environmental youth organisations attending, yet a strong passionate message was shared between all and I came away from the day feeling empowered and optimistic for the future. It was especially interesting for me to listen to other TNLs share their experiences and highlights from their own TNL journey. 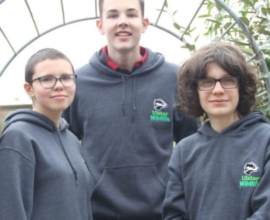 Our guest speaker Zach Haynes provided lots of enthusiasm, passion and humour whilst he shared his large array of wildlife experiences and stories through his award winning ‘A Year of Nature’ blog to his appearances on Springwatch. Amazing how someone so young has such a flare for experiencing wildlife – an inspiring talk from an inspirational young man. There was ample time to chat to other organisations and other young champions of nature. I enjoyed chatting to the guys from the Growing up Green project at Hill Holt Wood, another Our Bright Future project, and an inspiring social enterprise who are flying the flag for sustainability. Their work ranges from training student architects in environmentally friendly design and construction to up-skilling young people, often from challenging backgrounds, in woodland skills and crafts. It was great to see such a diverse range of people attending and it made for an enriching and valuable day. Our lunch was provided by ‘The Real Junk Food Project’ a brilliant organisation which transfers surplus food destined for waste into edible food accessible for all. After many delicious sandwiches which didn’t make the grade on the high street it was time for a guided walk around Potteric Carr Reserve. 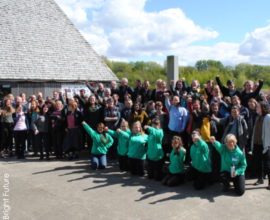 A big thanks to Yorkshire Wildlife Trust volunteers and trustees who attended the summit. 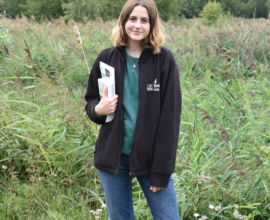 Their expert knowledge of the reserve and its array of wildlife made for an informative and interesting walk, taking in many bird hides and a good selection of wildlife which Potteric Carr Nature Reserve has to offer. It was especially nice to have good displays from the Marsh Harriers, including the juveniles which have been born and reared at the reserve. Following our walk, we had a chance to regroup and began open space discussions. It was great to be able to move from table to table, each offering a question regarding young people in the green sector, to debate and share our own thoughts and ideas. The room was alive with discussions and ideas which will be formalised into a report to provide future traction for the themes and ideas developed. Following the open space discussions, the youth summit was brought to a close. The last mocktails and remaining custard cream biscuits were soon polished off (mainly by myself). The TNLs thanked everyone for attending and for contributing such valuable and interesting insight throughout the day. As the last people left, my take home feeling was one of optimism. Such passion for the environment was palpable throughout the day. The recognition of the challenges which face nature and the enthusiasm to which the young people are prepared to meet these challenges is truly inspiring. Here’s to our young people and to a bright future!